To learn coding, there are two essential things you need. The first is coding training, and the second is a text editor. A text editor is a program that runs on your PC or Mac, which you’ll use to write all of your code. Think of it as like a word processor, but for plain text (no formatting). You can also customize the color schemes. All computers come with text editors built in. If you’re on a PC, then your built-in text editor is Notepad. If you’re on a Mac, there’s no program exclusively designed for writing code. However, you can set up TextEdit to work as a text editor by going into Preferences and selecting the Plain Text radio button. Most coders don’t use Notepad and TextEdit though – they prefer to download a more powerful, feature-packed text editor. Here are some popular choices. Sublime Text is a popular text editor. It’s available for PC, Mac and Linux, has many useful features and is easy on the eye too. Sublime Text is also the text editor used by Treehouse, a training website highly recommended by Code Conquest. A useful feature of Sublime Text is it has an expandable list of folders and files in a sidebar. This makes it very easy to locate and open up files. There are hundreds of different text editors. Some are well-known, and some are very obscure. In addition to Notepad, TextEdit and Sublime Text, here are some other popular options. 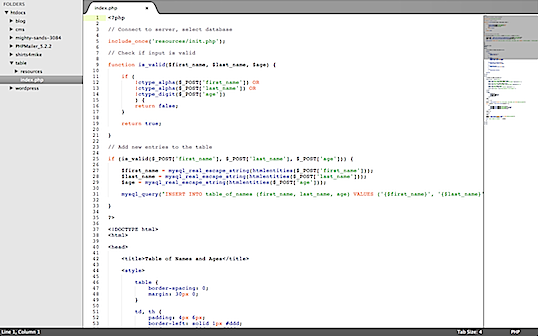 A free and open source code editor for Windows, designed to be a replacement for the limited Notepad. This text editor is for the purpose of designing and building websites, using HTML and CSS. It’s powerful and well-liked, but it’s costly too. A popular text editor for Mac OS X. Similar to Sublime Text. This is a popular text editor among many seasoned coders, but perhaps not the right one for a total beginner. If you’re working on a coding project, you’ll want to save your code files to your computer. Online editors like Codecademy, Scratchpad.io, jsFiddle and JSBin don’t let you do this. If you were thinking of using a word processor like Microsoft Word, Pages, Google Docs or Open Office to write your code, don’t. When writing code, you want it to be ‘clean’ and free of any formatting. This just isn’t possible with word processors. It may seem obvious to you, but some people do try to use programs like these to write their code. Don’t fall into this trap! Bare-bones text editors like Notepad don’t have much functionality at all – they let you write text and that’s it. It’s almost like writing with pen and paper. A word of warning to finish up. Some text editors are packed with features to the point where their interfaces can be quite intimidating. You don’t have to use these features, but they’re nice if you do know how to use them.